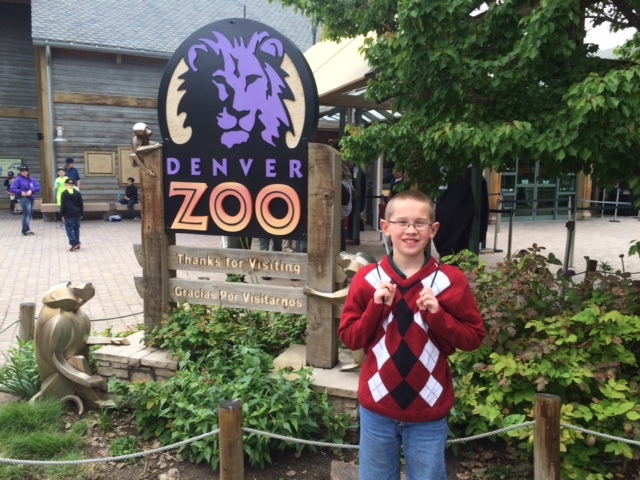 We got to spend the day at the zoo to celebrate Timmy’s math class team winning a Stock Market Contest in his school district. Last fall, Timmy’s gifted math class took part in a Colorado program called the “Stock Market Experience”. Many of states do this, and I remember a similar program while I was in high school, although I wasn’t part of it. Students are given a notional $100,000 bank account and are allowed to make investment choices in the stock market. At the end of the period, the winners are the teams/individuals who earn the most money. Staring skyward at their Elastic-Launched Glider. We’re so proud of Jacob (on the left) representing his school at the state Science Olympiad competition. 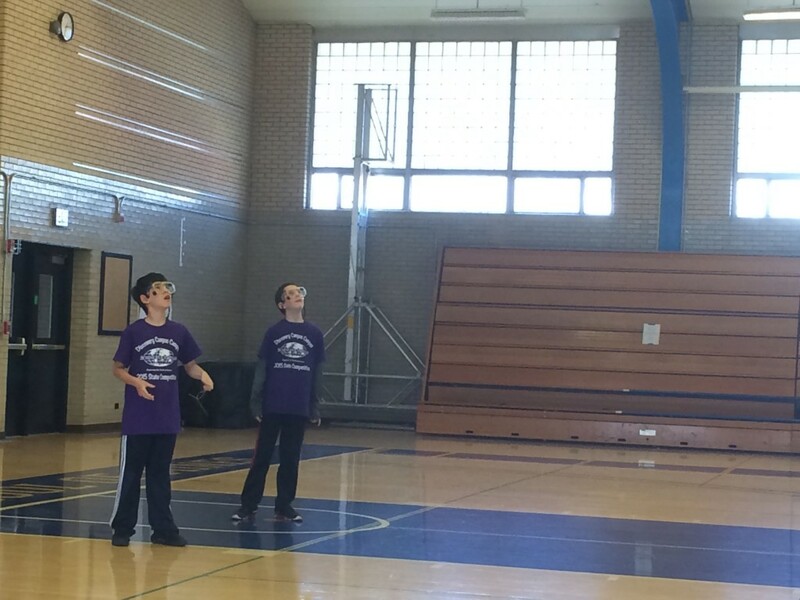 In March and April, our family was busy with Jacob helping his team for the Colorado Science Olympiad tournament. Plenty of after-school sessions, evenings at the kitchen island tuning his handiwork, and family trips to Colorado State University – Pueblo and Colorado School of Mines (known around here as just “Mines” — note the URL if you click through the link) for the competitions. Science Olympiad is a set of competitions in a wide assortment of science and technology topics. You can click the link above to learn more. I remember hearing about it when I was in middle and high school, and for a while I thought I had participated in a regional tournament when I was growing up in Virginia, but now I’m more certain I had participated in Odyssey of the Mind. I’m thrilled Jacob expressed interest in this group; he has a wonderful group of friends, not just in his own grade, but also in 7th and 8th grade. Road Scholar, which involves a problem solving exercise with maps. Jacob needed to be familiar with USGS Quads to be successful in this. Elastic-Launched Glider competition. The students craft a glider from lightweight wood, launch it with an elastic launcher of some sort, and see how long it stays airborne. Jacob’s glider had a LOT of trouble and wasn’t airborne for very long. I didn’t take any video. But here’s a video of one that stayed airborne for nearly 30 seconds (and won!) at the 2014 North Carolina competition at NC State. Reminder: This is NOT Jacob’s team! This is NOT even in Colorado! Jacob’s school finished in the middle of the pack for the state, and we’re particularly proud of Jacob’s performance in the Road Scholar competition, where he and his partner placed 7th out of the 30 teams! He’s looking forward to joining the team again next year. He was taking keen interest in the better-performing gliders and seems to have a lot of ideas for next year. Timmy studies his scrambled cube for 15 seconds before the timer starts. 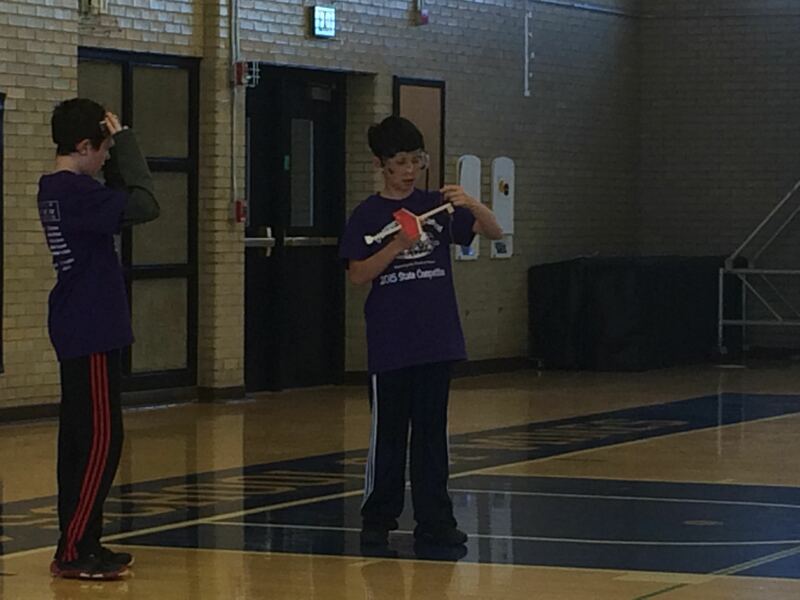 Last week, Timmy was on a team representing his elementary school at a regional Rubik’s Cube competition. It was his first experience, and was the first time his school had entered a team. Timmy was the only 4th grader, the rest of his team were 5th graders. While the team didn’t take home any prizes, they certainly are competitive and I’m sure all the students learned a lot. 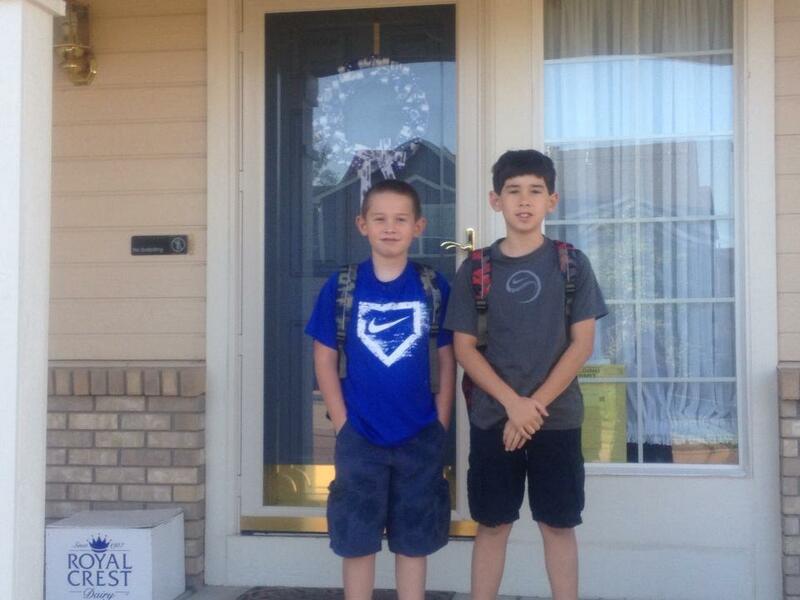 This week my sons started 4th and 6th grades. 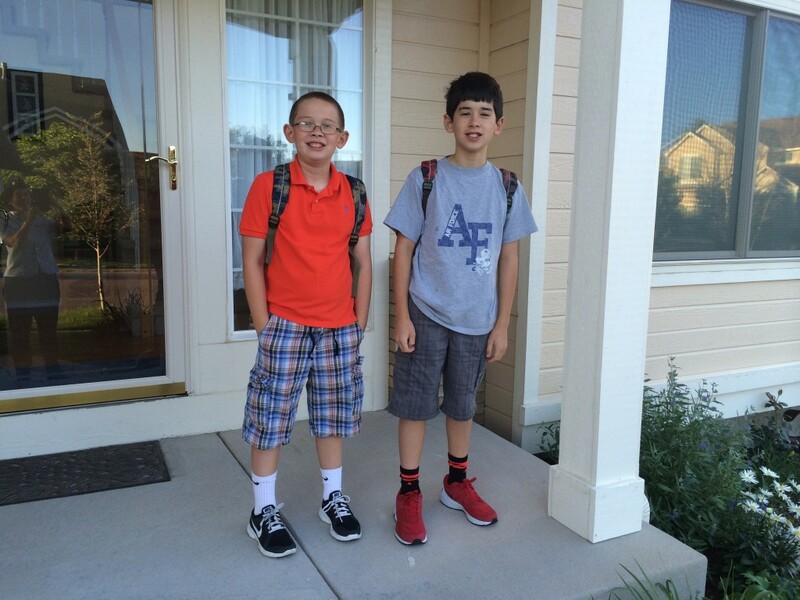 Both boys are very excited to be back in school. We’ve taken an incredible leap with Jacob’s school situation: we “choiced” him into a school other than the “neighborhood school” in our district. He’s now attending the school district’s STEM-focused middle and high school. I meant a(nother) new school coupled with the paradigm shift of a middle school schedule (9 different teachers!). It seems like a lot to pile on him, but he’s taking it like a champ. So far he’s really enjoying the middle school lifestyle and seems to be handling all the new information — things like block schedules, locker combinations to memorize, and dressing out for PE — really well. He is making some friends in his math class, and is looking forward to joining the Chess Club and trying out (yes, you read that right, trying out) for the Science Olympiad. Timmy was thrilled to be reunited with several of his 3rd grade friends in his 4th grade class. His new teacher puts an emphasis on keeping a class blog (WHOO!) that includes individual miniblogs that her students can write. It’s password protected, which I think is great when involving such young kids. I explained to Timmy that this is where he and his friends can “publish” the Adventure Time, Pokemòn, and Regular Show fan fiction they spent all their spare time writing. He is so excited about this coming year. As for me, I’m doing well enough with my classes. I have 77 cadets in 4 sections of calculus, and it’s been a pleasure getting to know them. 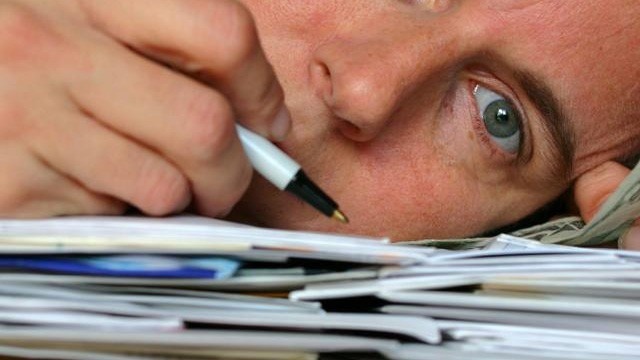 Making the right school decision in Colorado Springs can make you lose your mind. As promised, here’s the rest of the story with our school choice. The boys had expressed interest in the STEM schools in our district. This would be the Discovery Canyon Campus, a K-12 school about 9 miles away. Not unreasonably far away, and there would be bus service (somewhat) available if the boys got into the school. You can go back to Part 1 of this diatribe about how the choicing process works. In the months of January and February, each school offers a “choice night” where you can go to an information meeting and/or take a tour of the school. We attended both the Discovery Canyon Middle School and Elementary School meetings. The middle school meeting was very informative. Jacob and I were pleased with the school’s methodologies and programs. The tour of the school showed us some of the classrooms and Jacob was pretty excited about it. The following night we went to the elementary school meeting. The plan was to have Timmy’s second choice on his form be Discovery Canyon Elementary. The schedules would match up very well. Timmy liked what he saw with the school tour, also. You see, the neighborhoods nearest Discovery Canyon are building at breakneck speed. The biggest planned community is called “Flying Horse” and many young families are moving in with elementary-school aged children. Perhaps we should have left right then and there…but we didn’t. We stayed to listen to how the school distinguishes itself from the other (such as with their International Baccalaureate Primary Years program). Timmy really enjoyed learning about Discovery Canyon, but was more interested in School in the Woods. We submitted the applications in mid-February, and eagerly await the decisions about our sons’ futures. I hadn’t really heard of “School in the Woods” (I saw a girl at the boys’ school wearing a “School in the Woods” hoodie every day and that’s it), so I had to interrogate Timmy a little more about what it was. I’m about to embark on a topic and present an opinion that might make me very unpopular. When the weather cooperates, I have my sons walk to and from school. It’s about 1/2 mile, gently uphill towards the school, gently downhill all the way home. We are surrounded by houses with families who drive their kids to the same school every day. We walk past several houses where we see the kids loading up in the cars — to go to the same destination. Okay, so I’m a little behind. A couple days after the boys’ started school, I had to go for a 10-day trip to Nebraska (more about that later). 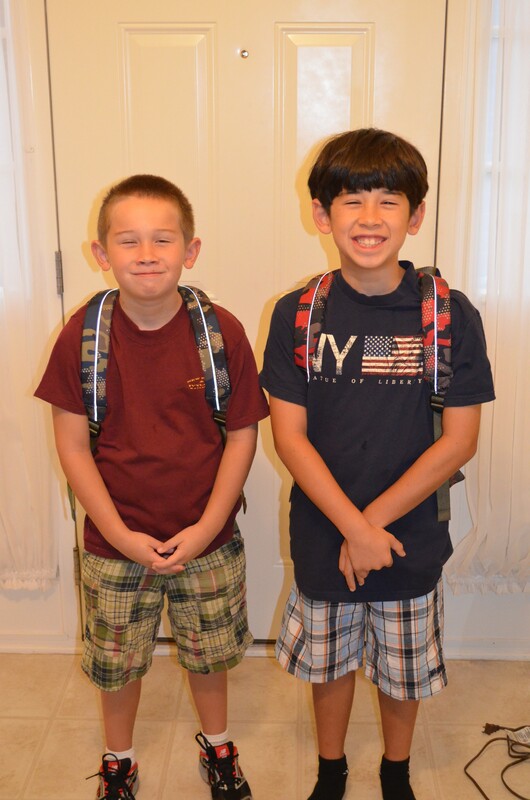 In an ideal world I’d have loved for the boys to dress up some for the first day of school, but (a) I have sons, not daughters who are more likely to dress up and (b) kids simply don’t dress up for the first day of school the way they used to. I feel like a won a battle (not the war) with their at least wearing “nice” shorts. This is from June 5th. I’m just sharing some You Tube videos I had taken of Timmy’s class’s “Patriotic Performance”. It’s a tradition with the school’s 2nd grade classes. Sadly, the school is so large you can’t get all the 2nd grade classes to perform on the stage at once…nor can you get that many kids’ parents/grandparents into the room to see it. There are four classes performing in these videos. I think there were over 300 second grade students at Timmy’s school. Nearly 1000 students in all for grades K-2. 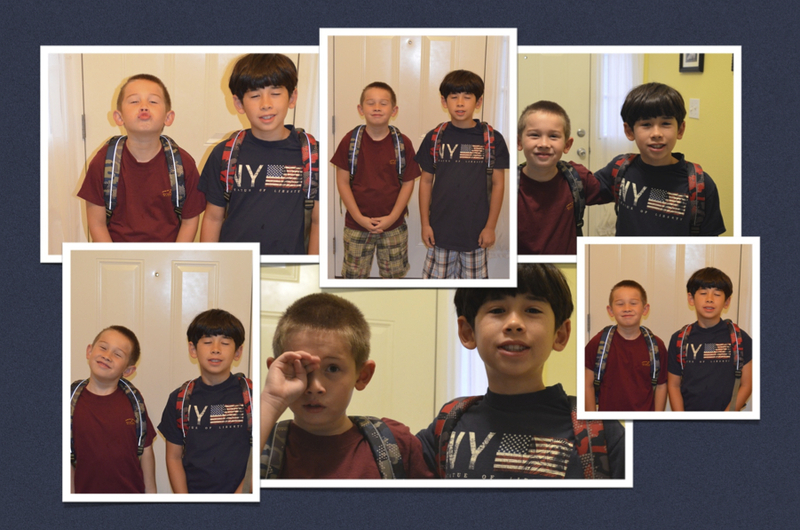 Enjoy a nice picture of the boys just before they headed out for the school bus yesterday. The boys both have great teachers this year and both have been reporting good days so far. Jacob’s happy to have many of his friends from last year’s class in his 4th grade class again this year. Timmy reports that his favorite thing about 2nd grade is being allowed to sit at the back of the bus. The best I could do in 21 takes…. I used to have a nifty collage capability in iPhoto, but with an upgrade earlier this year I can’t do the nice gridded pictures the way it used to be. But here’s an alternative showing some of our takes, ha ha!